Well it looks like Photo Bucket are back up and running and the thread is restored back to it's fun glory. Brilliant. 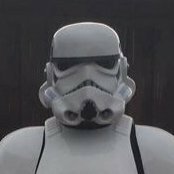 Sorry to interupt the thread but to clear things up regarding the Mimban kit referred to earlier. 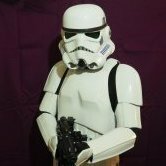 The Mimban TK kit that is available on EBay from Maker Of Things has been proven to be a recast of the Jim Tripon Rogue One TK kit. It looks like MOT is also recasting the ROTJ TK armour from C.F.O (Cast From Original has posted this recently on his FB page) and the stunt ANH TK armour from RS Propmasters. I am having trouble with Praetorian. He has not shipped my blaster after giving me two shipping dates and he is reading my PM's on facebook and not responding. Very cross with them as they were very chatty up until the point I paid. I am not feeling confident and hate this kind of practice. Surprised at them to be honest. I am having the same trouble. I have been given two shipping dates for a blaster and he has missed both. He is reading my PM's and not replying. Really pissed. He was really chatty up to the moment I paid him. I have carefully removed the forehead, snout and lens of the Anovos helmet to make painting a little bit more easier.I have sanded back the previous paint application with sanding blocks. Starting off with a grey primer. For the brown this time around I am using Halfords Ford Rio Brown. As we know the texture was applied using the beige so the rio brown needs to be flat and smooth to repicate the dark brown resin that the ST armour was cast in and is visible showing through from underneath the beige in a lot of reference pictures. 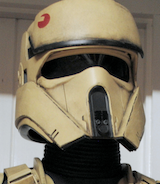 There are some parts of the ST helmet that appear not to be textured so I carefully mask the following areas. Forehead rim. Notches on the cheeks. Heat sinks. Bands on the temple. Neck ring. Vents on the rear and 2 longer vents at lower rear. Small ovals on each ear. Vent inside each ear. Recessed detail above lens under forehead. Note that I have used torn masking tape to recreate the paint damaged effect seen immediately above the blast shield rims of the Screen used helmets. I use liquid mask in some parts where its tricky to get tape positioned. Once all the areas are masked I use a clear lacquer to gloss the dark brown. When the gloss lacquer is dry the areas where I want the paint flakes to appear are masked using Humbrol masking fluid. For personal preference I have painted these harder to hit places first with sahara beige straight from the can just to get some proper coverage on them before I start with the texture. From a reliable source I was informed the texture of the ST helmets was applied through a paint gun. The paint was colour matched to the Montana Gold Sahara Beige then somehow I suspect using the settings on the gun the paint was allowed to be texturised. I want to try and mimic that process without using off the shelf texture paints.These Montana paints are used for graffiti and already the pressure is low when the paint is dispensed. I have switched out the standard nozzle for another that will splatter the paint. I want it to drizzle from the nozzle and not to be too atomised when it leaves the can. You can see how the paint is laying. I will build up the layers trying to keep them even despite the low pressure and tricky nozzle wanting to flood areas. It is a messy process but effective. You can see the texture is soft and not gritty. I do not want a gritty or coarse finish. The texture should be loose to allow the muck to sit in it correctly when I start to weather it. Once the beige is dry I can get the emblem on the forehead. The horizontal lines of the cut out in the emblem should sit at the same angle as the horizontal bands on the side of the helmet. These are good guides for achieving the correct orientation of the emblem. Mask. Paint. Peel.I remove the rest of the masking tape and fluid then paint the black details in. The snout, lens and forehead can be put back. These are the tools I use for weathering/ageing the helmet. I do not want to fiddle too much however I want a lot of muck and damage on the bucket whilst keeping the marks true to what is seen on the displayed costumes. The muck sits in the recesses of the textured paint. A variety of mark making around the bucket will give an authentic appearance.40 grit sandpaper by hand and belt sander will tear away paint to create the scuff marks and the masked areas once peeled will reveal the paint chips. A comparrison picture of the my finished helmet on the left and the screen used on the right. It is a much more accurate paint app than my previous attempt so I am happier with it. The texture is a lot softer than beofre and the weathering is applied with confodence using broad strokes I hope achieveing a more convincing dirty look rather than a painted one. Where can I buy the Rogue one backpack part? The antenna was made from a fishing rod. The Avanti Precision X 12ft float rod. It was only available in the UK through Sports Direct and has been out of production since early last year. The rod is now very hard to find. The NGT floatmaster is a worthy alternative as it is nearly the same dimensions. If you are needing the metal quick release hook that hands from the front left shoulder strap I have the original part for sale. Hello. I do not sculpt the 1/6th heads. I do paint 1/6th scale heads however I have most definitely never painted an Ed Norton sculpt so that work would not be mine. Thats very useful information thank you. The screen accurate JSP chin cup arrived. I am satisfied there is no way the red/white/blue elastic strap that comes with the cup was used for the screen used buckets. It's too narrow and the weave is wrong. I have opted for the 19mm black polypropylene webbing. I painted the cup with Halfords matt black, threaded the webbing through, utilised a couple of metal sliders from an old Swedish army back pack and attached these to the metal d-rings I have already fastened into the helmet each side. I Image from a screen used display. Nice picture here showing the difference between the textured surface of the bucket next to the smooth surface of the armour. That is a squirrel fan from Troopacoola in the Uk. There is one either side. He makes them with a foam casing to contain them. Nice kits and keep the fog off that visor. Damn hot in that Anovos bucket. The air intake is though that circular mesh and it pumps it out the top corner toward the lens. I bought these last July and cannot remember the seller on Ebay but I have one spare if you want me to post you one? I have added a chin strap to the Anovos bucket. I have a couple laying around and I had some 15mm webbing and a spare 10 minutes. 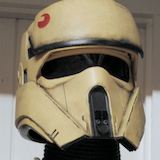 I have attached some chunky D-rings to the insides of the helmet with some velcro to make some mounting points. The chin strap is then threaded through them and fixed with the plastic sliders that the cups came with. All adjustable and removable. I must say it does increase the stability of the bucket on your head.